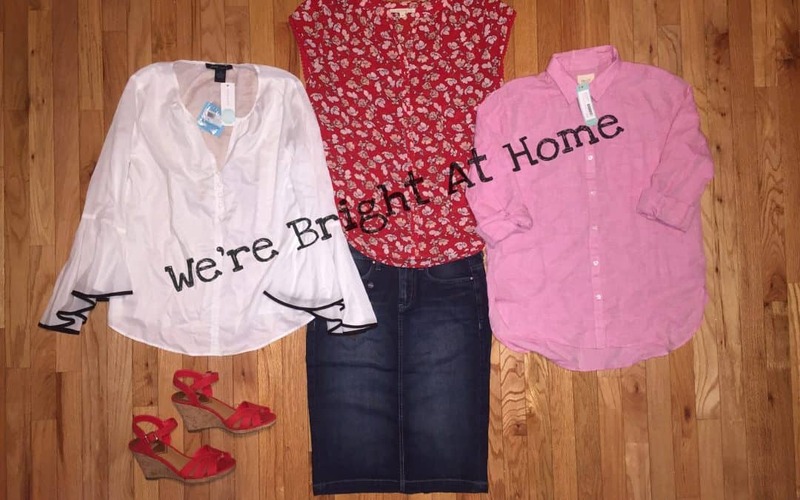 I’m trying to play catch up with my Stitch Fix reviews for the summer. I have been getting a box every couple of weeks. 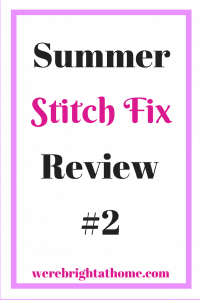 This is Stitch Fix Summer Review #2. If you haven’t seen the first Summer box I got, you can check out the review here. I asked my stylist to send me some cute feminine Summer tops and a top to match a maxi skirt I got in a previous box a while back. If you would like to learn more about how Stitch Fix works, you can check out this post. This is a nice plain top. I love the pink. The fabric was very soft. Here’s the thing, I don’t think it’s feminine. Yes, it’s pink and pink is a feminine color, but the style of this shirt is just a blah housewife shirt. There isn’t anything wrong with blah housewife shirts. I have a ton of them. Don’t forget, I requested cute feminine tops. I sent this one back. My stylist sent this top as a top that was supposed to match the maxi skirt I had gotten in a previous Stitch Fix box. You can see the skirt here. This looked like a cute top to go with the maxi skirt. It was white with black trim around the sleeves. Technically, the top definitely matched the skirt. Then I tried it on, I laughed until I couldn’t laugh anymore. The bell sleeves on this thing were obnoxiously huge. Seriously. I could have jumped off the roof of our house and took flight. Lol! My son, Jackson, said they looked like angel wings. It reminded me of something Desi Arnaz wore on the I Love Lucy show to sing the song: Babaloo while on stage. The fabric of the top was so thin that you could see through both layers when you held it up. I passed on this one. It was a hoot to try on, though. I haven’t seen a skirt like this in years. It was surprising to see it in my box. I don’t like it at all. It’s a very expensive pencil skirt. It fit like a tube and was too long. The denim was very thick. Pass. Now we’re talking! THIS is exactly what I asked for! It’s cute, Summery and feminine. I love the color, fit, fabric and style. This top is very affordable too. Perfect! I kept it. These wedges are super nice! They matched the top above perfectly. So pretty! Everything about the wedges was great, Except for one thing, the heel is too high. These sandals are not functional for me. They would be nice for date night. I can’t justify the $79 price tag THINKING I might wear them. Let’s face it, I won’t wear them. If the heel was at least an inch shorter they would be perfect. I asked my stylist for cute sandals in this box too. She definitely did that. They are cute, just not practical for me. I sent them back. Well, that’s my second Summer box. What did you think? The only thing I kept was the red FUN2FUN Zahari Split Neck Top.